Neuroscience isn't on many elementary school lesson plans. But this spring, a second grade class at Fairmont Neighborhood School in the South Bronx is plunging in. Sarah Wechsler, an instructional coach with wide eyes and a marathoner's energy, asks the students to think about the development and progress that they've made already in their lives. "You probably don't remember, but there was a time when you didn't know how to speak and you were just like 'Wah wah wah blah blah blah, mama, mama!' " she tells the kids. "Our brain grows and changes when you try hard things, when you learn new things." The children offer their own ideas. "Brains are pink!" "Your brain can get smarter. For example if you need help with your work, your brain is there in your head for you." 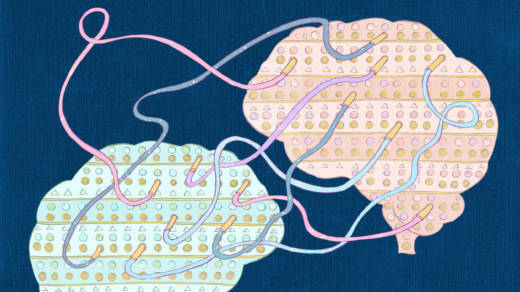 After watching a video with a cartoon brain, and doing an exercise where yarn stands in for connections between neurons, they seem to have absorbed the main point of the lesson. "There is stuff in your brain that if you take on a challenge and if you stick with it, it makes your brain smarter and it makes you smarter," says one girl. And Wechsler makes sure they also know the day's big vocabulary word. "Neuroplasticity! Say it to the light! Say it to the floor! Tell it to your brain!" The children here aren't just learning this word for a little science enrichment. They're learning it because their school, and the nonprofit Wechsler works with, called Turnaround for Children, are trying to put a wave of science experiments into practice. The big mission: empower children growing up in poverty with the research-based tools to transform their own developing brains. And that means, in part, giving them the understanding that brains can indeed grow, change, and heal. In the part of the South Bronx where Fairmont Neighborhood School is located, 49 percent of kids are growing up in single-mother households, according to Census data. Nearly half of families earn $25,000 a year or less; 17.5 percent make less than $10,000 a year. That kind of poverty is inherently stressful, says Fairmont's principal, Scott Wolfson. "Some of our students are sleeping in shelters, or not even in shelters but on the streets. They're thinking about, 'Where is Mom right now? And where am I going to sleep tonight?' That's a huge thing for an 8-year-old to carry." Chronic stress and uncertainty, not to mention missed meals and restless nights, make it physically and mentally difficult for children to concentrate or form trusting bonds with adults. They become hypervigilant, prone to emotional meltdowns, with bodies thrown into fight-or-flight mode at the slightest disturbance. "There's a body of knowledge that is not a hypothesis, it's a fact," says Dr. Pamela Cantor, the founder of Turnaround for Children. "Adversity alters how children develop as learners, and not in a good way." Cantor first learned about the impact of trauma on the brain and body in medical school at Cornell in the 1980s. She worked in mental health in poor communities in the Bronx as part of her training, and saw what she called a "symptom cluster." "It began to be obvious to me that all the children that I was seeing were struggling with relationships," she says. "They were struggling with learning. They were struggling with trust, struggling with attention span." And regardless of the details of their lives, she adds, these struggles had an underlying cause. "Adversity has a biological impact on children's development through the mechanism of stress," she explains. "Cortisol [the hormone released when a person is under stress] is toxic to the developing brain and immune system. It impacts the development of the architecture of the brain so that children don't grow up to have the attentional or behavioral control to be able to engage as learners." She says it's taken far too long for the science she first learned three decades ago to make it into schools. So Cantor took things into her own hands by founding Turnaround for Children. The group has been working at Fairmont since Wolfson took over as principal in 2014. And they are now expanding to 10 schools in New York City, Newark and Washington, D.C., while also working on research and policy to spread the word about the science of trauma and the science of resilience. Along with poverty itself, research shows that children in communities like these are more likely to have "adverse childhood experiences," known as ACES for short. These include the death of a caregiver, the incarceration of a family member, domestic violence, physical or sexual abuse, neglect, or addiction or mental illness in someone close to the child. When a child has more than four "ACEs," the impact lasts for decades. It can be seen not only in mental health but in the incidence of chronic diseases and even cancer. But, Cantor says, there's a flip side. While the young brain is impressionable to trauma, it can also be resilient. In a safe and orderly environment full of caring adults, she explains, children can find calm. They can build relationships. If they are given a chance to make better choices when they act out, rather than being punished, they learn that they can exert self-control. That, in turn, readies them to learn. "Neuroplasticity," that five-dollar word taught to the second graders at Fairmont, is the term that captures the ability of the brain to grow, change and form new connections into adulthood. That safe and caring environment is what Principal Wolfson and his teachers are trying to create at Fairmont, with Turnaround's help. Damon Cohen, who teaches second grade, is a middle-aged man with a beatific smile. "We are in the inner city and it's edgy," he says. "I want them to be peaceful, social creatures that know how to work and act and communicate." The school has come a long way, but also has far to go. A previous school in this building, P.S. 50, was phased out by the city due to poor performance. Fairmont was founded to replace it using nearly $3 million of federal grant money, by a principal who was gone within a few months. Wolfson, who was raised in the Bronx and has spent most of his education career here, stepped in midyear. Both he and parents say the building used to be chaotic, with children roaming the hallways and fights in the classrooms. Tameka Cassaberry has two girls at Fairmont and is the PTA president. Her older daughter, Kya Anpong, now 10, started in the previous school in kindergarten. At Kya's end-of-kindergarten celebration, a physical fight started among family members in the audience, and spilled onto the stage, Cassaberry says. "My family was there recording it, and it was out of control and it was embarrassing. People left, they didn't get to see my daughter perform. She was afraid to." Cassaberry pulled her daughter out and sent her to school across the district, a tough commute. Now they're back at Fairmont. "With my older daughter, I've seen a crazy improvement," she says. "Her reading is amazing." Wolfson reached out to nonprofits like the Children's Aid Society and the Girl Scouts to provide afterschool programs and other services. One day when I visit, several children in each classroom are wearing brand-new glasses supplied by donation. He turned to Turnaround to help his teaching staff. "Teachers needed a lot of professional development," he says. "They needed to be able to create physical environments that would be able to support children's success," and "allow and encourage children to work together." Turnaround spent their first year in the school helping teachers perfect order, habit and discipline. The theory here is that chaotic schools — a loud hallway, a messy class — simply reproduce the stress that children may bring from home. Rules should be the same across the school, so students know what to expect. And students should be met with understanding and patience. No detail is too small. I sit in on an individual session with Wechsler, Turnaround's instructional coach. She and a new teacher hash out whether to line up for lunch by girls and boys, or by table. Many classes are team-taught, or have paraprofessional aides to help with behavior issues; nearly a third of the students are in special education. When children act out, teachers give them a chance to calm themselves, and look for root causes. "My son was having issues a couple years ago, so he was seeing a social worker," at the school, says Tracy White, who has three boys at Fairmont. "She'll bring him to the office, have him color or take a walk so he could get his anger down." Principal Wolfson says that with concerted effort, suspensions have fallen to fewer than one a year. Last year, Turnaround introduced daily mindfulness sessions, after lunch, which had been a tough transition time. They use an app called Headspace. The classroom I visited fell perfectly silent for 10 minutes while the British-accented voice of a former monk filled the room, narrating a guided relaxation exercise. Some students stretched out on the rug and closed their eyes. Others pulled their hoods over their heads. Students say Headspace "quiets down your mind," "makes me feel calm and is fun." It's more than that too, says Cantor. "Meditation has roots in neuroscience." Regular mindfulness-based stress reduction, she says, can actually shrink the amygdala, the "fear center" in the brain. Children who practice calming themselves get better at it. They spend more time in a state of mind where they are open to learning. This is the term coined by Stanford psychologist Carol Dweck to describe the belief that people can progress and get better through effort, as opposed to "fixed mindset," the belief that ability is innate and unchanging. Experiments show each of these mindsets can become a self-fulfilling prophecy. In a group professional development session, Wechsler coaches teachers on giving feedback. Instead of telling a child "Good job!" "You're so smart!" or "Wrong answer! ", the teachers are encouraged to praise a student's effort; ask them about another strategy they might try; or even talk directly about how hard their brains are stretching and growing. Before the session, Wolfson speaks to the teachers about how he himself is trying to adopt a growth mindset about the progress that needs to be made at Fairmont. "Thinking of ourselves as learners means that we will have the ability to get better through practice, through effort, and through possibly failures along the way," he tells me. "Growth mindset is helping, not only my children, but also my teachers, to understand that." Over the course of the spring, Wechsler comes into each classroom, from kindergarten to fifth grade, to help teach growth mindset. It takes some time to schedule these, because the school also has to get ready for an intensive quality review from the district, as well as spring testing. The changes at Fairmont have yet to be reflected in dramatic improvement in academics. Last year, just 10 percent of students met state standards on the English Language Arts test, and just 8 percent in math. That compares with 40 and 39 percent citywide. Turnaround for Children is tracking its impact across schools in other ways. They have documented improvements in classroom management and student engagement, using independent observers. They have also seen drops in suspensions and increased referrals to mental health services. And most recently, they've found that students' theories of intelligence are changing. After the growth mindset lessons, they are more likely to say they can get smarter if they try. "I do worry about our test scores," says Wolfson. "Unfortunately, that's like the bottom line for us. But without the social-emotional support we can't address the academics. We have to support the whole child."